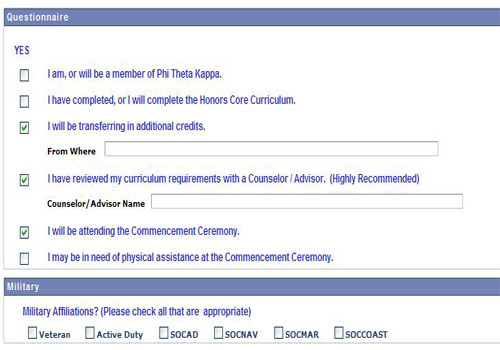 Under Academic Records select the Apply for Graduation link. The graduation application will extract information that has already been entered in SIS. The Application Date and Student Name appear as verification of your sign-in. Personal Information displayed is based on your Personal Information (main phone, business phone, mailing address) in SIS. You will not be able to update your address or telephone numbers during the Application for Graduation process. To proceed, you must select the Proceed with Making Application button. Step 2: Select Institution and Term. If the institution is not available it means you are not currently active in a degree/certificate plan or you may be placed in an incorrect plan and/or you have been discontinued and need to reapply to the College before applying for graduation. 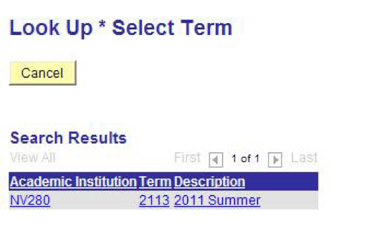 When the Select Term lookup is used, only the term for which date ranges have been specified by the Central Records Office will be displayed for selection by the student. For NVCC, only one term will be available. Step 3: The application process continues with the Academic Plan section. 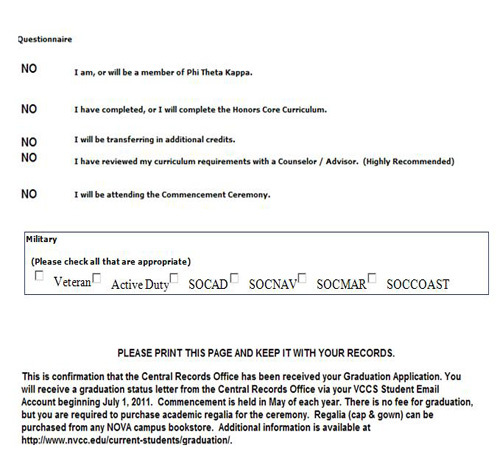 You have been program placed in the plan listed above; select each degree or certificate for which you want to apply for graduation. Check the box to the left of each plan selected. NOTE: If the plan you want to apply is not listed here, it means you are not currently program placed in that the plan. You must contact the Student Services Center to update the Student Program/Plan selections in order to apply for the degree or certificate of choice. If you were previously awarded a degree or certificate, your Diploma/Certificate name will default to the previous name in this section. You can make changes to the previous diploma name; this will be saved with an effective date in SIS under the name type of 'DEG'. If there is no previous degree award name, the first name, middle name and last name will default to the Primary Name in your personal information in SIS. If you may make changes, those changes will be displayed exactly as they will appear on the diploma. Once you submit the application -- the diploma name will be stored in SIS. You will be asked to review and agree to the information in this section. When the I Agree box is checked, the Submit button will appear for final submission. Upon clicking the Submit button, you will be presented with a confirmation page that includes all of the information that was selected or entered on the application. Your student EMPLID#, your Name and the Application Date appears on this confirmation. This confirms your application has been received by the Central Records Office. You should expect to receive a status letter via your VCCS email account two months after submission.